In a rather alarming development, I’ve noticed a bit of a religious theme emerging in the Dates with Dublin adventure. While I’ve always been a bit of a nerd when it comes to history and old things, religion and the church tend to make my hackles rise. I’ve found of late, however that I’m being oddly drawn to cathedrals, chapels and cemeteries, even when going about my regular business. Despite the variety of stuff to see on my list, my head now turns when I pass a particularly interesting-looking church, and I sometimes have to forcibly stop myself from sneaking off into graveyards while nipping out to fetch a litre of milk. To date, I’ve managed to refrain from spontaneously breaking into hymns (bar a very devout and heartfelt rendition of ‘The Green and Red of Mayo’ in Another sacred ground at 5pm last Sunday – more about that later), but this unexpected religious draw certainly got me wondering. Last Thursday afternoon I cracked it, as I parked up the bike and tiptoed into John’s Lane Church on Thomas Street for a quick nosey. (Incidentally, The nerd in me was fascinated to learn on my way in that Padraig Pearse’s dad James was responsible for the sculpting of the statues on the bell tower.) As I sat gazing around at the ornate altars, the stunning stained glass windows and the marvellous mosaics, with only one other for company, the noise of the traffic chaos outside melted into the background and I started to relax and feel a welcome sense of quiet and calm. It struck me that in our everyday lives, we rarely take time out to do nothing; to have a quiet moment of peace and reflection – to just be with ourselves for a few minutes. An old friend of mine, though not particularly religious or indeed at all saintly, is a regular mass attendee. I asked him why. “It’s like this,” he said. “I don’t give a monkeys about the prayers or the preaching, but it’s the one hour in a week where I’m forced to sit down away from the phone and the laptop and the TV and all the distractions I have around me. If nothing else, it gives me time to think and have a good daydream.” Food for thought indeed and maybe it’s something worth making a bit of time for. I wandered down the path, which is beautifully surrounded by weeds (I’m not being sarcastic here, honestly) to the door, and arrived just as the guided tour was beginning. Nice one. Entry to the church is free. Even nicer. I was welcomed by a cheery chap dressed in full Norman-style chain mail regalia who was clearly getting into the spirit of Heritage Week. I hope he has no metal allergies. St. Audoen’s is the only remaining medieval parish church in the entire city, and is named after St. Ouen (or Audoen) of Rouen in Normandy, a bishop the Anglo-Normans must have been fond of, I suppose. The church, remarkably is still in use for parish services today. Though built in 1190, it was reportedly built on the site of an older church dedicted to St. Colmcille, dating from the seventh century, which really is a rather long time ago. And when I walked into the building it felt, unsurprisingly … old. Very old indeed. The building is home to a few items of note. Firstly, when you enter beside the simple altar, you’re faced with the large, ornate 17th century monument to the Sparke and Duff families, two wealthy Dublin merchant families, who lost their fortunes in the Dublin Gunpowder disaster of 1597. Unusually for its time, it is made from plaster, not stone, and features symbols of the families’ wealth (like pineapples) and images of death (skulls). Surprisingly, this is not my photo, but that of a very good photographer named Andreas F. Borchert. Continuing down the church towards the main entrance, on the left sits an impressive church organ, which is also used to this day. It’s unusual you see one up so close and personal and as always when I spot an organ, I had to drag myself away lest I be tempted to sit down and bang out a tune – Chopsticks probably wouldn’t have been quite appropriate. The hard wooden pews are lined with soft coverings which I’m sure are infinitely more comfortable than the stone floors the medieval pilgrims had to endure. I’m told they got straw mats for special occasions, but unlike today, the religious ceremonies of the time were cold and draughty experiences with no hot air at all. Ahem. Tempting … and oddly orange-tinted. Not the organ. My photo. 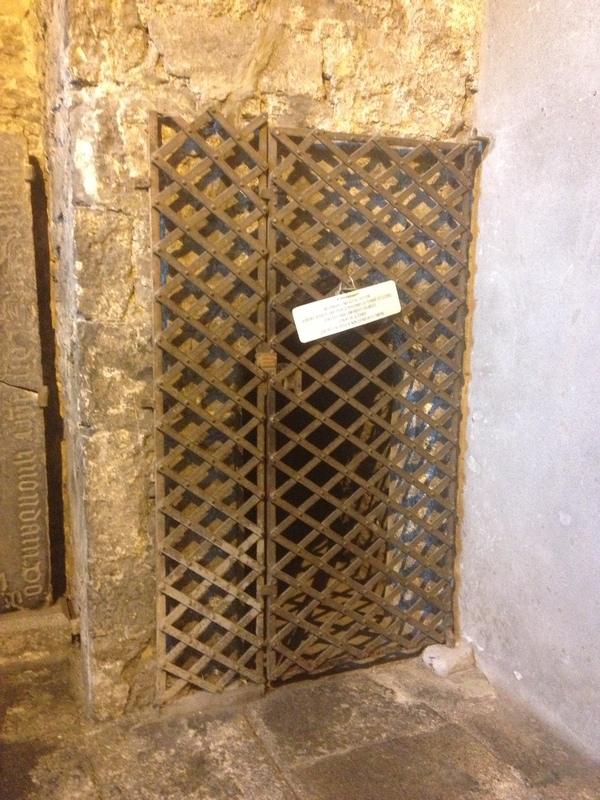 Near the back of the church sits a 12th century baptismal font, which, hidden from Cromwell and his mates in the 1600s and forgotten, was unearthed during restoration work in the 19th century. The font dates from the 12th century and bears the shell or scallop symbol of the Camino de Santiago, the Way of St James, a journey undertaken by many medieval pilgrims ending at the Cathedral of Santiago de Compostela in Northern Spain. Having walked a 250km section of the Camino a couple of years back, I was intrigued to learn that poorer pilgrims received their initial blessing at the start of the journey at St. Audoen’s (which is based near James’ Gate, a traditional Camino starting point) before travelling via Bristol by Sea to France, where they walked the full 800+km. Meanwhile the rich folks just paid other people to do the pilgrimage for them. Lazy sods. 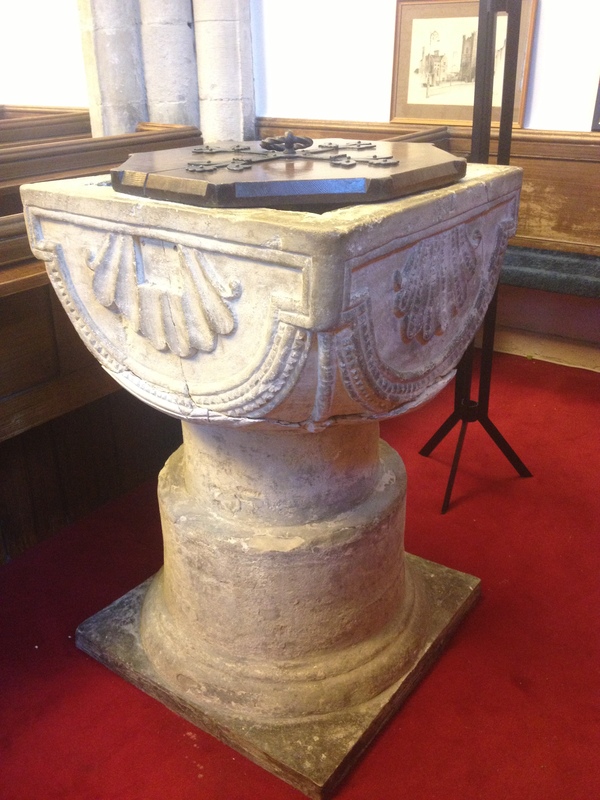 The font was locked in the olden days, as it contained two items of great value at the time – a lead lining and holy water. Tragically, the two treasures mixed a little too well and it’s said that contamination of the holy water with the lead resulted in the untimely deaths of more than one unfortunate child after baptism. 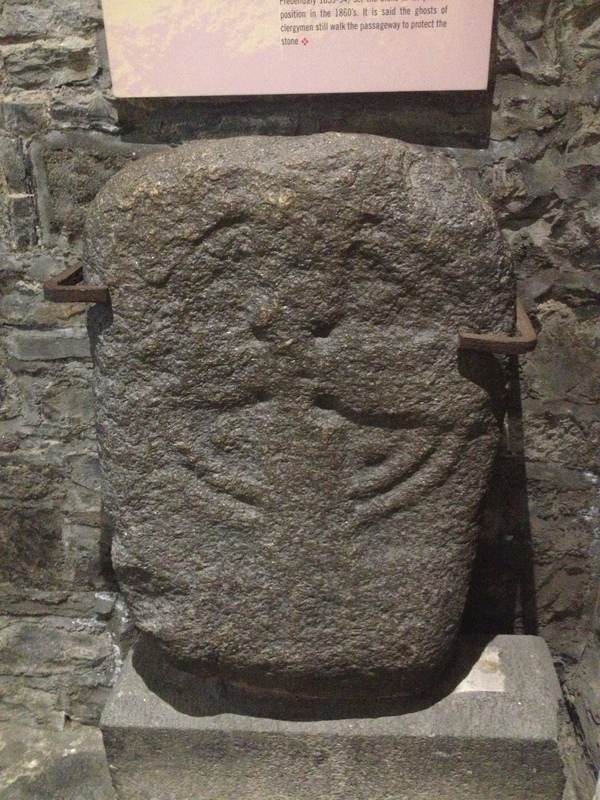 Out in the porch, there’s a “lucky stone”; probably a gravestone that may have originated in St. Patrick’s Cathedral nearby – there are similar stones there. Merchants and traders used to rub it for luck, after it was erected in the 1300s beside a marble water cistern in Cornmarket, so that all who drank of the waters may have luck. It is said that the reverend who placed the stone in St. Audoen’s centuries ago still pops back now and again, probably to give it the odd rub. You can never have too much luck, even when you’ve been dead for a few centuries. The stone has been stolen on a number of occasions, but mysteriously, has always found its way back. Spooky! Whaddya mean, he’s behind me? The bell tower in the main entrance area houses three of the oldest bells in Dublin city, dating from 1423, and they are still rung every Sunday. The bell tower stone staircase is gated off but is tantalisingly tempting – I really wanted to sneak back in when everyone had and make a break for the bells. 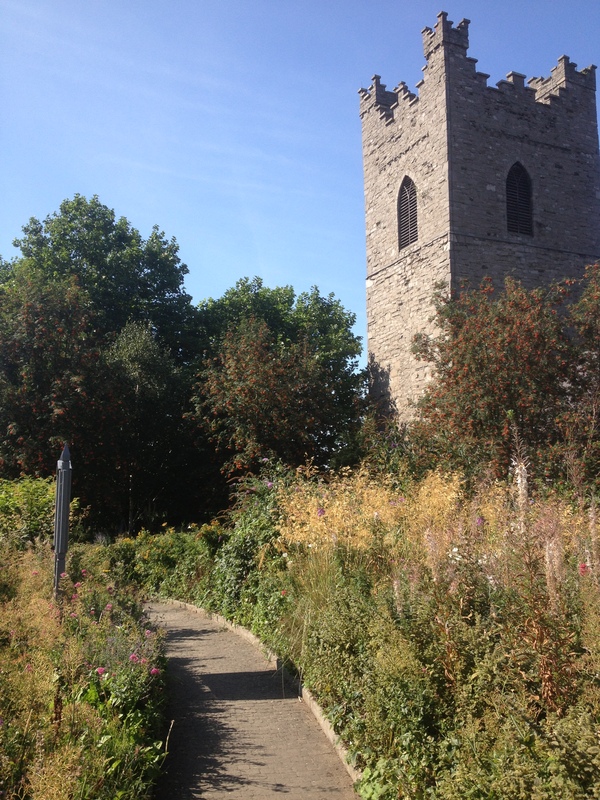 As part of Heritage week St. Audoen’s opened the bell tower to the public, a rare event indeed and I was sorry to have missed it, being as I was on a pilgrimage elsewhere – again, more about that later. 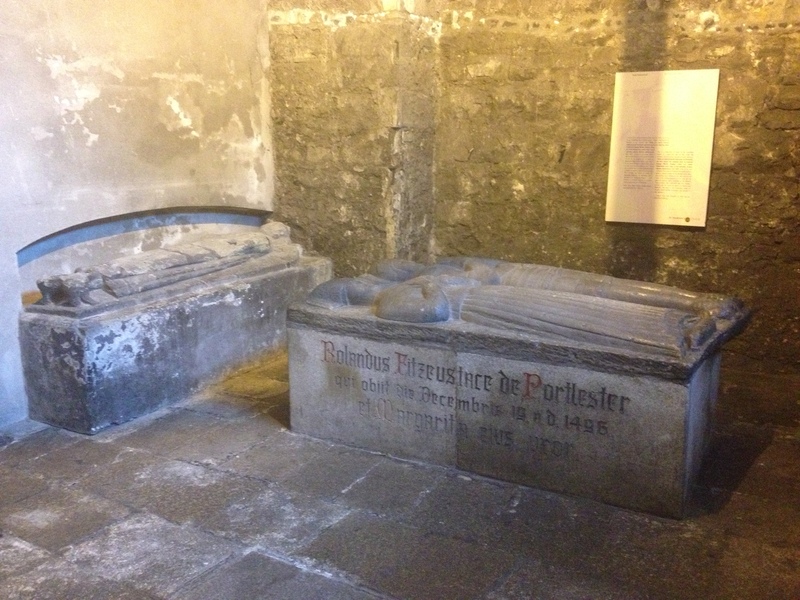 The main entrance area also hosts a 15th century effigial tomb to Lord Portlester and his wife Marguerite. Lord Portlester had an impressive CV, firstly holding the position of Deputy Lord Lieutenant of Ireland, then Lord Chancellor of Ireland and finally Lord High Treasurer of Ireland. Overachiever. The effigy shows Lord Portlester lying with his feet resting on a dog. The dog’s mouth is closed, meaning in the symbolism of the time that its owner died a peaceful death. Lord Portlester was clearly an optimist and possibly a psychic, given that he built the tomb 14 years before his death. Of course, “effigial” means that they’re not buried there at all, so technically it’s not a tomb. But I suppose it’s the next best thing. Anyway, there are lots of dead folk lying around underfoot which, as regular readers will know, always makes me happy. Pretendy tomb. I went for a close-up view to capture the detail… oh. 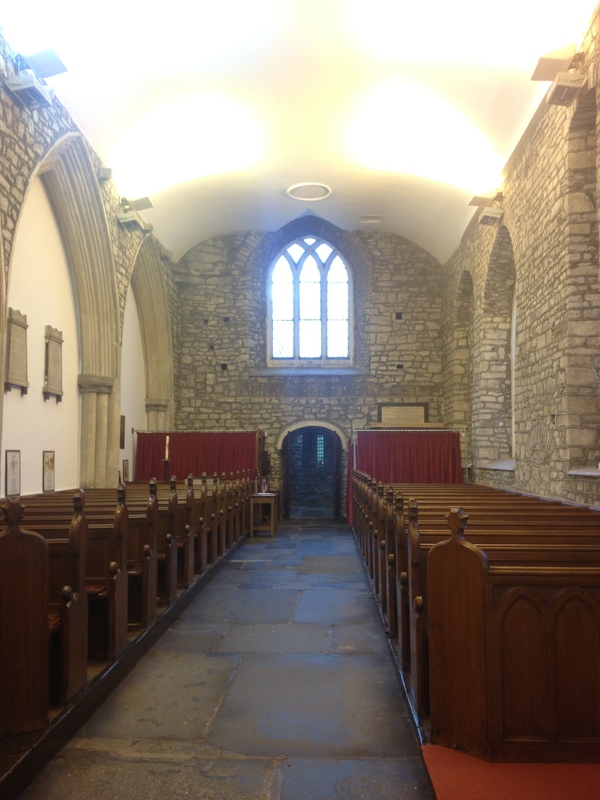 There’s a wealth of medieval history associated with the building, and the mix of Gothic and Romanesque architecture tells stories of its own, particularly when you go outside to the private chapel, which was built to accommodate swelling congregation numbers in the 1400s. What I really liked about St Audoen’s is that the story of the church and the guilds that frequented it is told really well, both by the guides and the visuals in the exhibition area. For me, it was clear, interesting and engaging, and in this, it stood in contrast with other museums. For instance last week I also visited the Story of the Capital in City Hall, and for a museum in such a stunning location, and with such a fascinating story to tell, the visuals left me confused, cold and if I’m honest, a bit bored. St. Audoen’s on the other hand, managed to draw me in and transport me to a world of medieval merchantry and religious ruaille buaille, and I thoroughly enjoyed my visit. If you haven’t been, I’d recommend popping in if you’re wandering past – it’s like a little trip into the Dublin of old and I doubt you’ll regret it. You might even take better photos than I did, though it’s probably unlikely. Speaking of religion, the next post on Dates with Dublin will be an entirely self-indulgent and emotional account of my most recent glorious pilgrimage to the ultimate temple of worship – Croke Park, where the highlight of my summer to date saw the Green and Red of Mayo overcome the Farney Boys of Monaghan and the Red Hand of Tyrone to see us into not one, but two All-Ireland finals on September 22nd. To keep it on topic, I’ll also tell you a bit about the other stuff you can do in Croker, even if you never looked sideways at a sliotar or football in your life. Stay tuned! Thanks John – I really appreciate the kind feedback. I’ve been enjoying it immensely myself. As for the photography – the less said it about it the better really 😉 If you ever find yourself in the city with your camera at a loose end, give me a shout! Must agree with John above, a very informative and sometimes witty piece, dam it, sure I can hear that auld organ playing in my ear. Keep it going girl -keep it going….. I love weedy church yards! Something much more mysterious and inviting that the well-manicured ones. 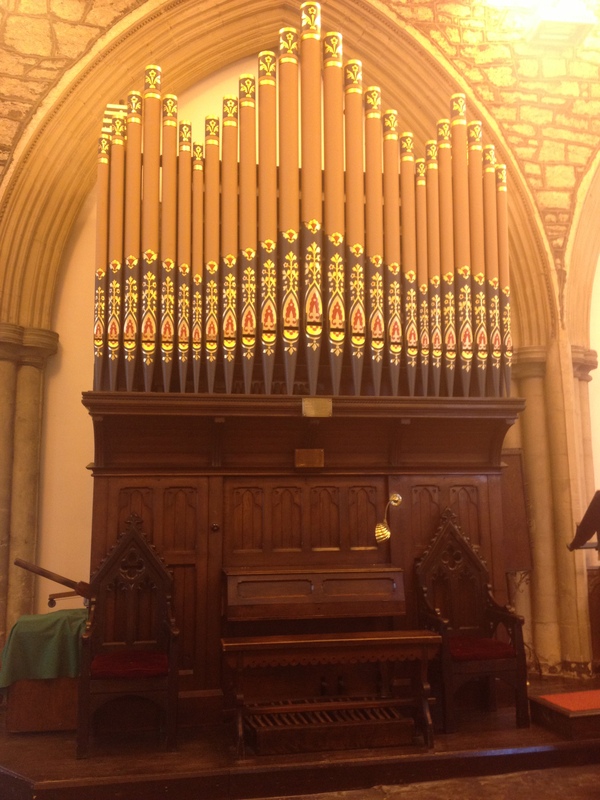 Just visited St Audeon’s and wanted to look up some of its history – your writing is accessible, interesting and informative. Enjoyed reading it.